So i just got my Ecoxotic EcoPico that i ordered from ecoxotic.com today! 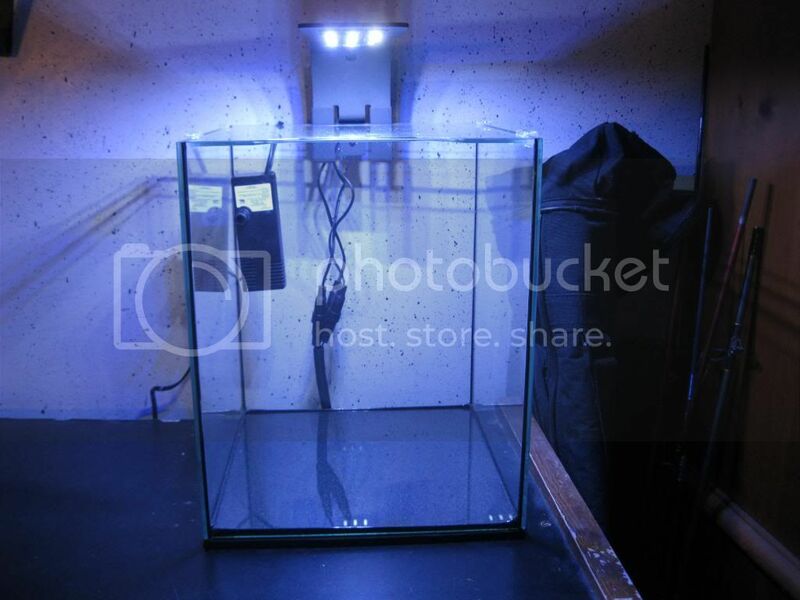 so stoked So i deid a 5.5 gal nano a while back, but i got to busy and had to sell it. However, now that summer is approaching i will have plenty of time to fool around with it. But enough with that here are the specs! 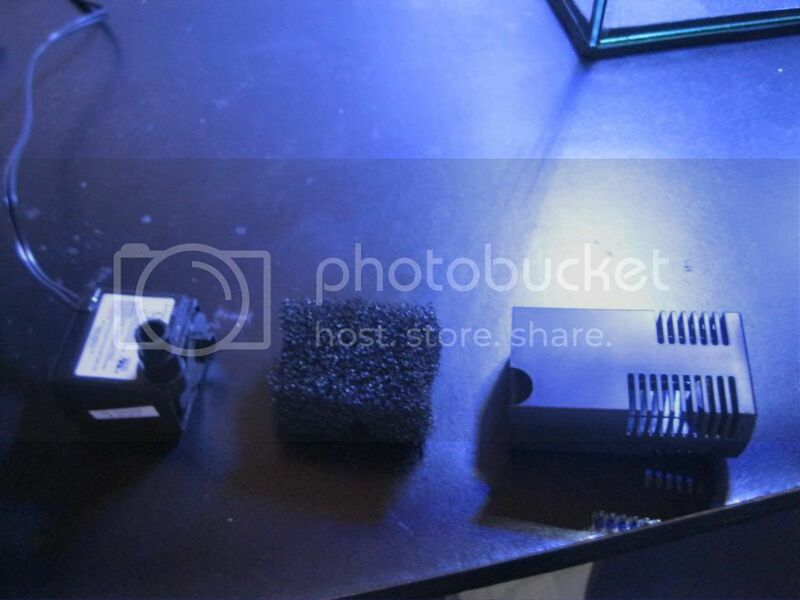 - Led arm light with 3 strips of blue and white leds (total of 6, 10,000K whites and 3, 4nm blue leds) The sight said that these leds will support "your most light loving corals" so i have faith in them. 5-7 pounds of live rock and 5 pounds of white sand, Hey Alex what kind of sand do you use? I want it to be a mixed reef so heres what i have already to put into it: bird of paradise birdsnest, gsp, a huge blue mushroom from marine extreme and candy cane coral. 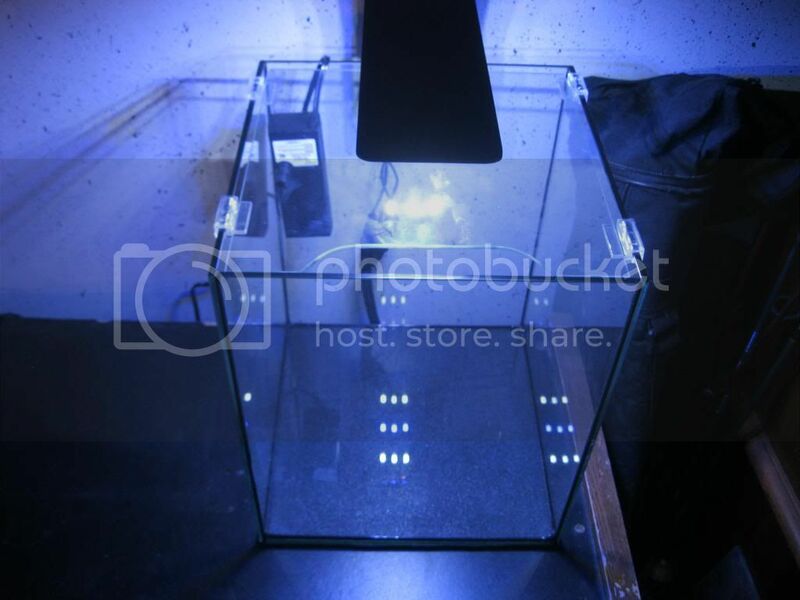 still trying to decide, was thinking of maybe moving my watchman goby into it, but the other 3 fish i am trying to decide on are: spot tail blenny, neon goby, or clown goby. Im thinking 2 fish max. Any thoughts of other fish or in general? Here are the Pics! Let me know what you think! im always open to advice! 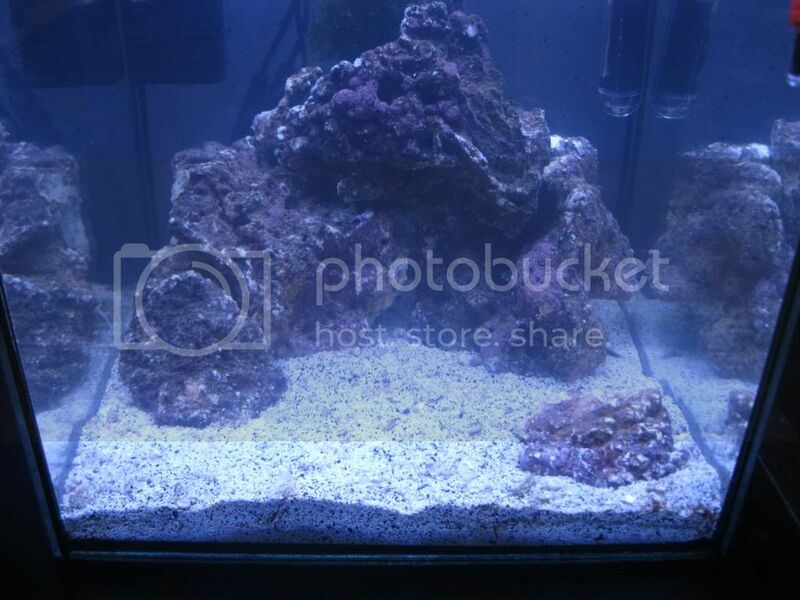 Special grade reef floor sand is what I like and is what was in the 40b you got from me. I agree 2 fish max and make sure stay under a 1" max size. If could find a mated pair of little gobies like my little red one, would be sweet! sweet thanks Alex! and ya i love that little goby you have. Where did you get him? 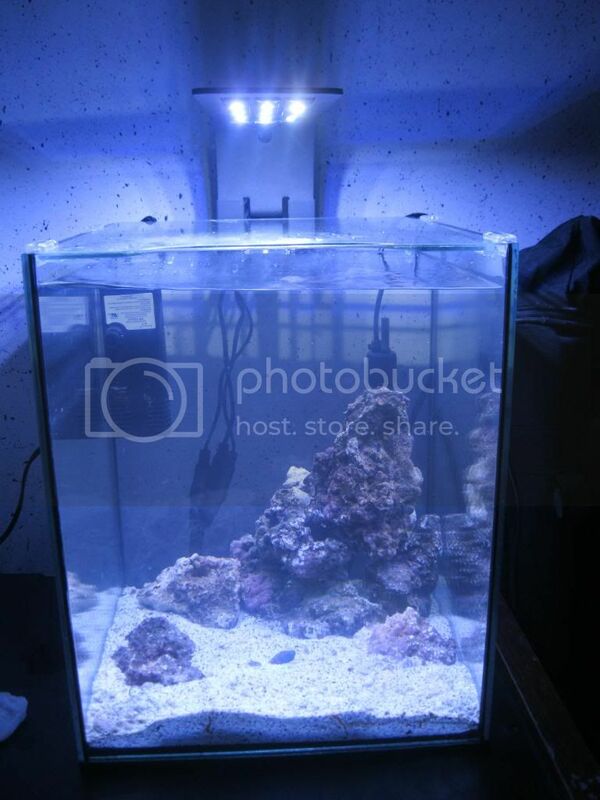 Also i would like to start my tank with live sand so i dont have a cycle. Does anyone have about 5 pounds of white live sand i could purchase from them? Thats a slick tank. Looks very professional. I got him at petco. But I have seen live aquaria have them to. Ok so update! i went over to Joe's (Joker's) house today and picked up some very nice liverock for my aqauscape! Thanks Joe!) so after spending an hour with my hand in the tank i am still not happy with my aquascape, it needs more rock, but i will work on that tomorrow. 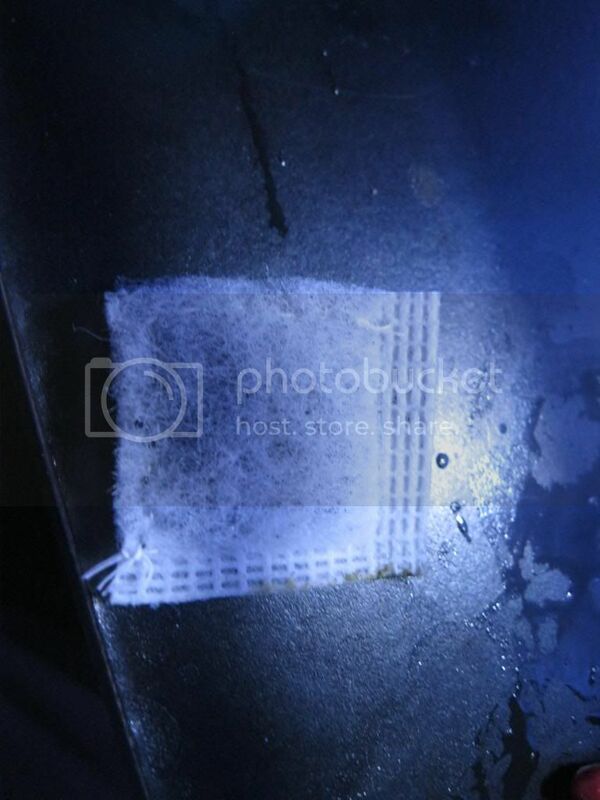 I also modified the filter by taking out the sponge that it came with, removing half of it and replacing is with filter floss and a diy carbon pack (im actually pretty proud of my self ) here is the current fts, and yes i still need to get a backround let me know what you think< oh and the lights are at about 70% in the pic. Looking good Justin!!!! I'm glad you like the rock and it looks great in your tank!!! If you would like any more just holler! Looks great. I love the rimless look. 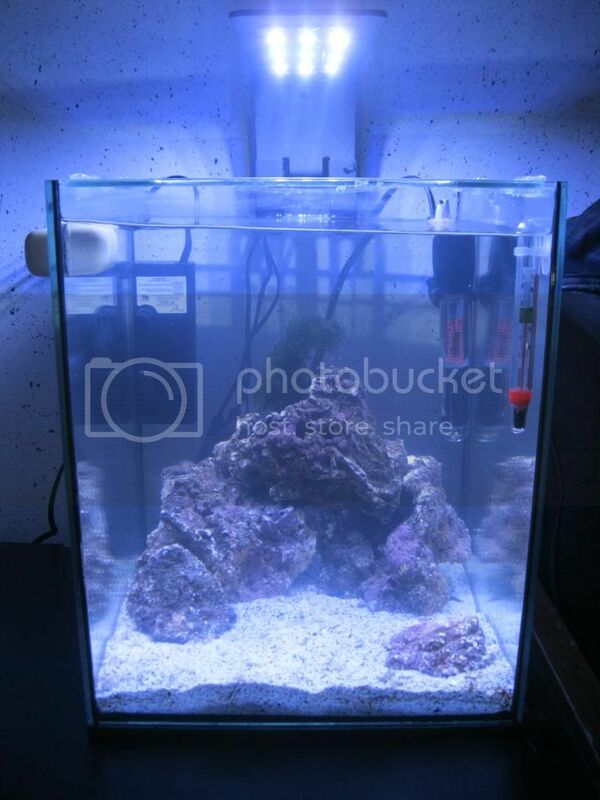 Aquascape looks good thou, however you don't wanna to have the rocks touch the glass cuz then it will be super hard to clean. To much time looking at it than work..lol. keep the pics coming. thanks everyone! at Justin, your right, i will probably do some rock moving today and Jim i have mine on my desk too and i know i wont get anything done! on another thought, what is the smallest heater that you guys know of, besides the under gravel ones? ok i finally got the rock work the way i like it. I haven't tested the water yet, but it shouldnt be to bad considering i used liverock and live sand. Ill do some testing later and let you guys know. more pics! The water is still a little cloudy from messing with it. Looking good...like the open front area.